At Sargent Toyota we are always up for a road trip, especially during winter when Alberta is absolutely full of spectacular highlights; however, the best road trips are always those that are well planned and prepared for, so if you are hitting the road this winter be sure to keep the following essentials in mind. Make sure that your vehicle is prepared to handle anything that Mother Nature throws your way by having it inspected, tuned up and winterized in every way possible. Everything from your engine, wipers and defrost through to your brakes and battery need to be in prime condition, and switching to winter tires should be considered essential. Investing in protective mats or liners for your vehicle is also a wise move, as this will prevent ice, snow and mud-covered boots from damaging your vehicle’s interior. If you aren’t already a member of a roadside assistance program, sign up before you head off, and if you are a member consider upgrading your coverage for the duration of your road trip. Look into where you can find a decent mechanic along the way just in case a problem arises and let friends and family know when you expect to be back so they know if or when to worry. If you will need to book accommodation, festival tickets or any other elements of your trip do so well ahead of time, because you won’t be the only one planning a road trip this winter and you don’t want to risk arriving without a space saved for you. Whatever you book, find out about any cancellation fees as well, just in case a big storm comes through and you can’t make it to your destination. Those planning on skiing, snowshoeing, skating or even tobogganing on their trip should plan to bring any equipment with them if at all possible, because having your own gear can save you a pretty penny on rentals throughout your trip. Some of the best opportunities to get out and play may also be in places where no rentals are available. Your vehicle should have an emergency kit in it at all times, especially during winter when being well prepared can literally save your life. 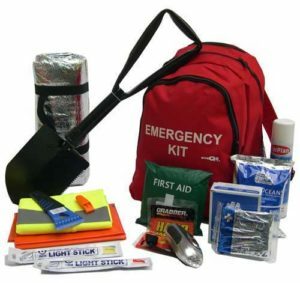 Your emergency kit should include at least the following items. Make sure that your vehicle is ready for those winter challenges ahead by booking your appointment to have the skilled mechanics here at Sargent Toyota give it a thorough inspection before you head off. Those looking to invest in a quality new or used vehicle will also find a huge range of fantastic options right here, so give us a call, connect with us online or drop by and let our team of experts help make this winter’s road trips your best yet.